The 621 is the flagship pencil for the Nataraj brand and one of their oldest pencils. 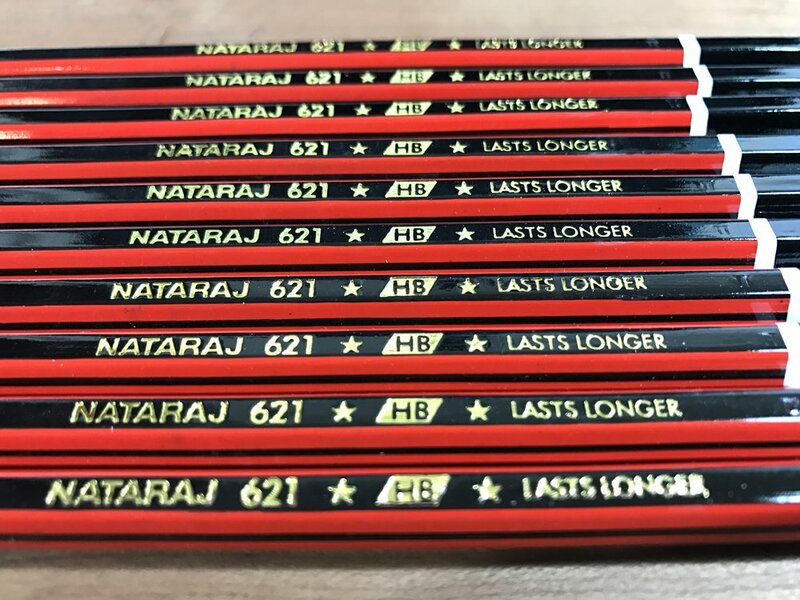 Depending on the market you're in (or obtaining your pencils from), the imprint and color availability can be different, but the name Nataraj 621 is the one constant. According to the Hindustan website, the 621 is available in multiple colors for the international market, including green, blue, silver, and white, in addition to the standard red that's available in the Indian market. The red is called "Ruby", and sometimes I've seen this pencil reviewed as the Nataraj Ruby 621. The current incarnation of the 621 from India is what I'm reviewing today. Mine were obtained from a seller on Amazon and were packaged in November of 2016. I actually like the box of the international package better, but that's neither here nor there. If their advertising is to be believed, this is the school pencil of generations of Indian kids, like the Staedtler Noris or the Dixon Ticonderoga are for their respective markets. The stripes on the 621 are awesome. Of the 6 sides, only one is full black; that's the side with the gold foil imprint. On the other 5 sides it's red with a thin black stripe down the middle. It looks like the thin stripes of the Joi, but instead of on the hex edge, they go right down the center. 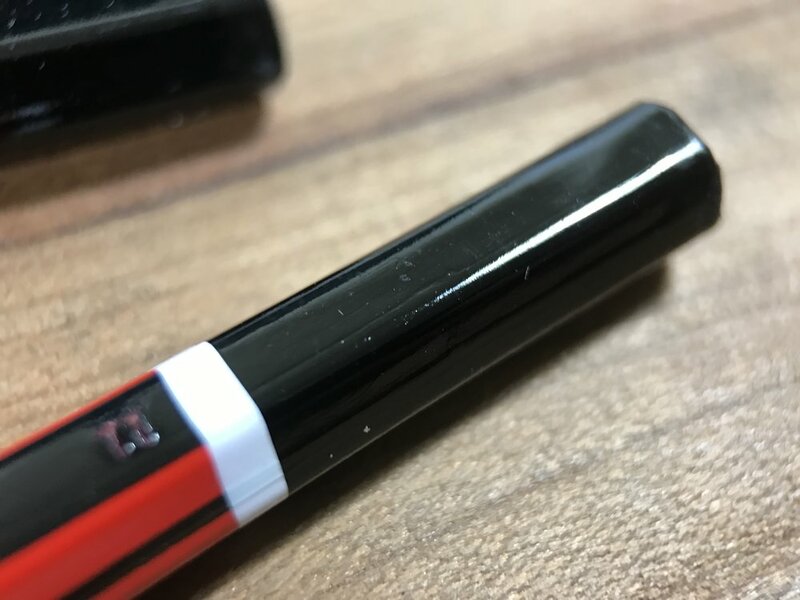 The black end dip is separated from the rest of the pencil with a white stripe. The lacquer is nice and even, though the white may be a little thin, as you can see the black stripes underneath it when you look closely. The imprint says "Nataraj 621", then has a star, a parallelogram pill that says "HB", another star, then the words "Lasts Longer". 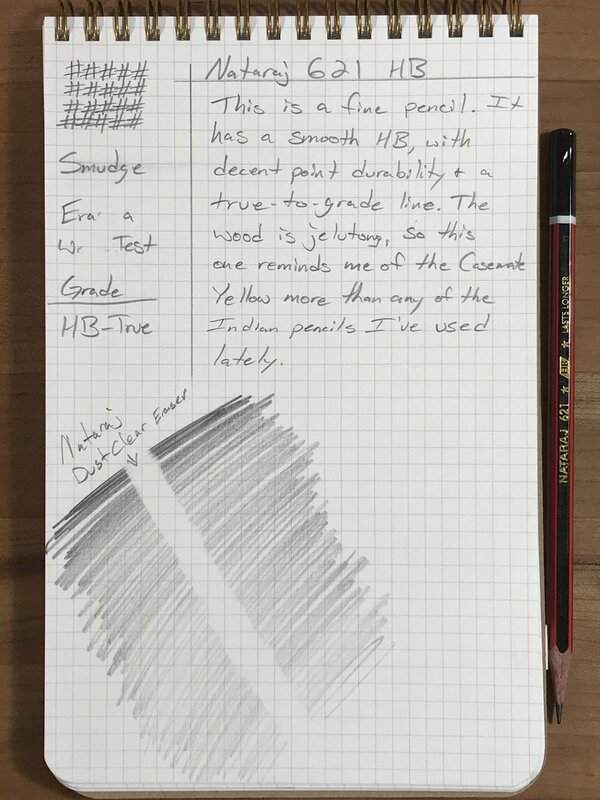 This is very light with no eraser, so in the hand it is balanced. Jelutong wood is ugly until it gets sharpened up. Another reason this pencil is light is the jelutong wood. This one has a little red-tinge to it, maybe due to treatment, maybe the lacquer bleeding into the wood? Whatever reason, I like it. It looks cooler than just normal basswood, and I have gotten over my snobbiness about a jelutong pencil being so cheap I won't touch it. A pencil doesn't have to be cedar to be good, though I miss the smell from time to time. Jelutong sharpens well, but it seems that lacquer doesn't stick to the shavings. Which is fine, they're just shavings, but when hand sharpening, the now-free lacquer tends to get a little staticky and likes to stick on my fingers! That doesn't happen to all the jelutong pencils I have used, but it seems to happen to ones without primer underneath, and these don't have primer. If this is the pencil school children in India get to grow up with, I consider them lucky in that aspect. I grew up with boring yellows from Dixon, Empire, and others. Hell, early on in my school years, it was big news when someone had a non-yellow pencil, like they were rich or something. Today, the choices are infinite, but I like to think I would have been happier with this pencil or another cool striped pencil like the Noris. The box comes, of course, with an eraser and sharpener. I didn't record a video for this one, but below are 2 Nataraj 621 commercials, one from black and white TV days, and a remake. Watch them, you'll get it. Also, if you get a chance to got down a rabbit hole, check out the Nataraj and Apsara commercials on YouTube...they are usually pretty funny, even when I can't figure out what they're saying. Available on Amazon, $4.18 with sharpener and eraser.